Climbing Africa's tallest mountain is a once in a lifetime journey that will change the way you look at yourself and the world forever. On this special trek we'll summit on the solstice, a time to celebrate new beginnings and the light that is to come in our lives! Taking on this challenge with other adventurous women from around the world makes this hike even more meaningful and special. 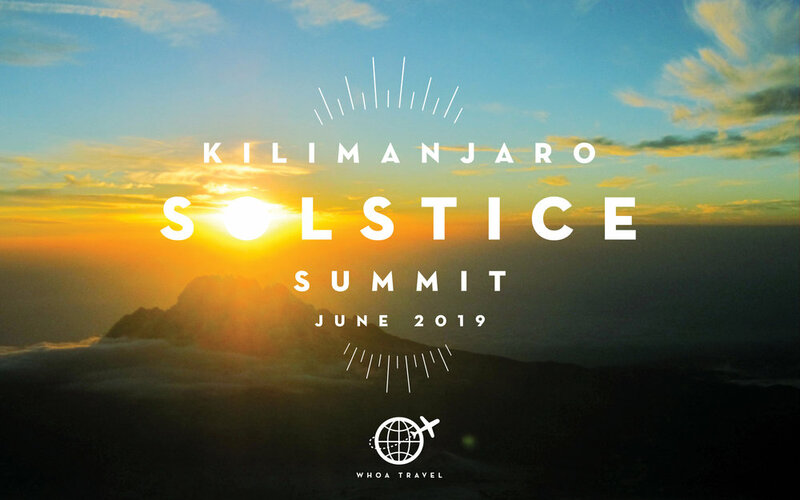 Join us in trekking up 5,895 meters, through five beautiful climate zones, to the Roof of Africa: Mount Kilimanjaro! Experience the support, safety and smiles that make all WHOA adventures so special and such a success. Expect to be challenged, changed, inspired...and to partake in some awesome high altitude dance parties! *Putting down a $500 deposit ($600 with SAFARI) will reserve your spot on this adventure (which is a good idea because it will fill up fast)! You'll be invoiced and must pay in full at least 3 months before the adventure start date. All deposits are non-refundable. BE SURE TO CHECK OUT OUR OTHER AMAZING UPCOMING KILIMANJARO ADVENTURES! Perfect for chillin' and killin' it on the trails. KILIMANJARO SOUNDS KILLER...TELL ME MORE!